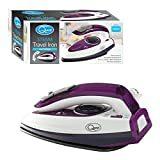 When traveling, you'll pack away your clothes in your luggage—but it's good to be prepared for ironing your clothes if they should become creased. Also, if you do your laundry away from home, you might have to also iron your clothes as well to get out any wrinkles. You don't want to carry something as heavy (or expensive) as your regular steam iron. If so, a travel iron is a great convenience. 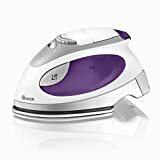 They can be very compact and lightweight, and can still do an adequate job of ironing your clothes—at half the cost of your standard iron. You'll be surprised by the number of features available. 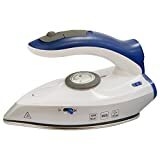 Steam Iron: After filling this type of iron with water, you wait until the iron heats up. It then can emit a burst of steam for removing wrinkles from a garment. Non-Steam Iron: These are no-frills, which don't use water to help you get tough wrinkles out. But they can still be adequate for simple ironing chores. 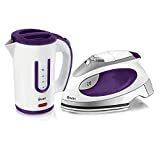 Beware of leaking irons: Some customers were very displeased with the Black and Decker F210 iron because it would leak water while ironing. A similar defect was found with the Sandalwood Mini Travel Steam Iron, albeit not as severe. The Conair EZ Press had better reviews, holding a larger amount of water for a longer time. 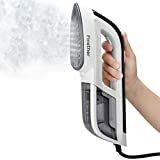 Prefer No Auto-Shutdown: Even though Auto Shutdown is a convenience in some products, to save electricity, it can actually be a big bother with an iron. 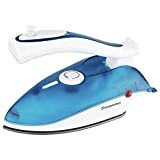 Some people complained that an auto-shutoff would sometimes mean that the iron would get cold in the middle of ironing! The Conair EZ Press did not have that problem, and seems to be better in this regard as well. Power: You can judge how strong an iron is by how many watts of power it consumes. The Hamilton Beach 10092 uses 800 Watts of power. Long cord: The Conair EZ Press Steam Iron has an 8-foot long cord, so you're not confined to ironing right next to the power outlet. Works at both voltages: Since an iron uses a lot of power, not every power adapter is suitable for converting the voltage. 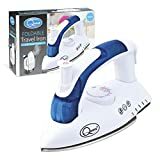 It's best to buy an iron that can be used at both 110 V and 230 V, without having to look for a travel adapter. Good for thick garments: Some travel irons simply don't have the power to get the wrinkles out of thick garments. Multiple heat levels: A main feature of an iron is that it can be adjusted to several temperatures: the low temperatures are for delicate fabrics, and the higher temperatures for cotton and linen. There are travel irons that also have a wide range of temperatures. 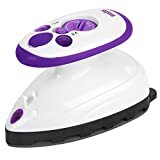 The Sandalwood Mini Travel Steam Iron has low, medium and high temperatures. The Collar Perfect Compact Touch-Up and Travel Iron has five(!) temperature settings, which allow you to get exactly the right temperature whether you're ironing polyester, silk, wool, cotton, denim or linen. Packs compactly: The Black and Decker X50 Travel Iron has a handle that folds up, making for a very compact design. The Collar Perfect iron even has a lined travel bag, for you to manage packing the iron up neatly. Time limit on how long it can work: Some travel irons are not built to do more than 30 minutes of work at a time. That's important to note, so that you don't burn out the heating element from too much use. PurSteam—are makers of powerful steamers for consumers. Their steam products are made for disinfecting and cleaning without using harsh chemicals. They are located in Buffalo, Wyoming. Black & Decker—was founded in 1910 by S. Duncan Black and Alonzo G. Decker. They are manufacturers of power tools, accessories, hardware, and home & garden improvement products. They are based in Towson, Maryland. 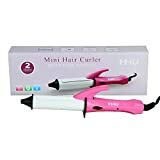 Conair—is a corporation of companies that manufacture hair care, personal health, and skin care products. Conair was founded in 1959, and they have their headquarters in East Windsor, New Jersey. 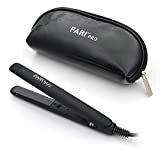 They also make home and travel solutions, such as handheld steamers, lamps, and spa benches, as well as luggage scales, chargers, and AC adapters. SandalWood—are manufacturers of technological products for the nature lover—people who are looking for eco-friendly products when traveling, camping, hiking, and gardening. They are based in New York City. They make travel irons, bug zappers, tents, lanterns, and flashlights. Collar Perfect—are located in Charlotte, North Carolina. They make a portable travel iron that can remove wrinkles from even the smallest sections of a garment. Their iron also opens up and allows you to iron larger sections as well.